HONDA has thrown its full technical weight behind the launch of its all-new VFR800 – and our first ride of the bike suggests the huge number of changes to the top-selling all-rounder have been very much for the better. The engine is more tractable in the mid-range than ever and there's a definite kick in the pants at 7000rpm when the VTEC system alters key valvetrain parameters to change the engine’s state of tune from favourable for mid-range torque to favourable for top end power. The handling has also been improved without compromising the old model’s user-friendliness, the styling has been brought bang up to date and the linked brake system has been revised for the better too. To see an onboard video clip of the bike in action, including the V-TEC " kick " at 7000 revs, follow the link in the Related Stories panel (right, below pics). You can follow the other links in the Related Stories panel to find out more about the bike or join discussions about it in our Talk Bikes area. MAKING big changes to the VFR is one of the hardest jobs for Honda. On the one hand it has designers keen to push everything forward. On the other, it knows there is a loyal band of riders out there who love the VFR in all its incarnations, from the original 750cc bike, through the adoption of a single-sided swing-arm to the increase to 800cc on the current model. And understandably Honda doesn’t want to upset any of them. For much of its life the VFR has been the ultimate all-rounder. Only distantly related to the full-on race replica RC30s and RC45s, the VFR has been all things to all men for more than a decade. But more recent attacks from the likes of Ducati’s ST4 have meant it has really had to fight for the first time in its life, and it has been knocked from the top of the sports tourer pile. So the time was right for a major redesign. The staff at Honda believe this is the biggest change it has ever made to the bike. The styling is more radical than the conservative designs that have gone before, with futuristic points to the lights and twin exhausts under the seat, but the biggest change by far is to the engine. It’s still a V4, it’s still 800cc but the gear-driven cams have been ditched to make way for a chain-driven V-TEC valve system. That’s a bold change to make. Memories are long, and VFR riders are likely to be the people who remember the camchain problems that dogged the original VF750 that was the forerunner to the VFR. There were a mixture of camchain tensioner and camshaft problems with the VF that so dented Honda’s pride that the firm went for a belt-and-braces gear driven cam system to restore its image for reliability. That’s the scare. Now the good news – if you like the current VFR, you’ll like the new one even more. Even the briefest of rides shows Honda has addressed what it needed to with the VFR without upsetting the qualities thousands of riders love. Luckily we had more than a quick ride to get acquainted with the machine. It might not have been in Portugal’s Algarve, where Honda planned to launch the new model until the war in Afghanistan led to it stopping all staff flying for fear of terrorist attacks, but a couple of days in Hampshire allowed a good test. There’s little doubt that while the weather conditions were poor, it was more like what UK riders will have to face if they ride year round. The test saw us take advantage of some unexpected sunshine, hide from the sort of rain that would have worried Noah and contend with some pretty strong winds to boot. The styling has been through a lot of development, according to Honda’s Dave Hancock. He is one of a small group of development riders drawn from Honda staff across Europe. Part of his job is to work alongside the designers to make sure their designs are actually practical – that clocks are readable, that controls are useable. Early in the process a life-size clay model of the bike is built – Hancock described the first version as " spiky " , with far more pronounced points to the indicators and fairing than the production model. Still using the classy single colour options, the new design is in danger from one typically Japanese trait – the desire to put names and acronyms all over the place. All models feature a V-TEC logo under the main VFR badge on the flank. Then there’s the CBS Combined Brake System sticker on the front mudguard. Go for ABS as well – available as an optional extra – and you get an extra sticker for that. It may be a small thing, but having offered a range of clean colours, it seems a shame to break it up with the stickers. There is also a new colour on offer – alongside the traditional silver, black or red will be " Lapis Blue metallic " , or Blackbird blue to you and me. The base for Honda UK’s release of the new VFR was Thruxton race circuit in Hampshire. Great, we all thought, a race track and a pretty sporty bike. Not so great was how wet the place was. Light rain gave way to a brief spell of sunshine before a monumental deluge made the track unusable. Playing with the V-TEC engine took everybody’s mind off the rain, however. You don’t need corners to get the best out of that. You need straights where you can just open the throttle and go. Under 7000 revs the motor feels strong. It urges you forward powerfully but politely, with a feeling of restrained force. Then something else happens. There’s a mechanical crackle and rasp, the bike gives you a much ruder boot in the backside and you start going forward at a much faster rate of knots. It isn’t gargantuan. It isn’t going to set race replica riders’ pants on fire, and presumably it isn’t meant to. The VFR just isn’t playing that game. The kick from the V-TEC also isn’t going to send your front wheel skywards and your pillion passenger into the path of oncoming traffic as you accidentally hit the power while overtaking traffic. The designer, Takaaki Tsukui, who usually works on V-TEC for Honda sports cars, hasn’t lost sight of this bike’s market when adapting the system for two wheels. There is a very noticeable increase in the power when the V-TEC kicks in, but the overall delivery of power remains fluid and progressive, as on earlier VFRs. Light riders reported the back wheel could spin in the wet as the V-TEC kicked in, but at a less moderate 13 stone, that wasn’t a problem for me. Again, in the world the VFR is expected to live in, that should only affect a very small number of riders, and only when riding alone or without luggage. Honda has also succeeded – at last – in getting some more noise out of the V4 motor. And it’s the noise you’ll want to hear. There’s a lot of induction howl in the mix, which means it isn’t just bystanders who get to enjoy the music – you get enough on board too. There’s a good strong burble from the pipes, with a deeper note under it all from the airbox. If there’s one thing older VFRs lacked, it was the sort of sound you expected from a race-related V4. This has it, but it isn’t going to upset your neighbours. Interestingly, you won’t notice the increased rasp when all four valves kick into action. On board the bike you really notice it – there’s a slightly metallic feel to it. In neutral, on the side stand it doesn’t do it, nor even in gear on the centre stand. But on every bike in the test, hit 7000rpm in any gear and you got that same noise to go with the power. A race track isn’t a VFR’s natural habitat, though you’re almost guaranteed to see a few at any track day you go to, so it was a surprise that Honda chose a circuit. With a wet track, nobody was out to set lap records, but around the fast turns at Thruxton – probably the quickest track in Britain – the VFR began to hint at the neutrality of its handling. The VFR’s brief is about as wide as you can get in the motorcycling world. It’s expected to do everything short of racing (though older models certainly were) and motocross. This is the bike Honda expects to take you to work every day, to take you on holiday with the other half and luggage, and to take you to knee-down excitement when you reach the twisties at the other end of your journey. In between it should handle weather, town, getting lost, turning around and taking the odd low quality farm track as you find the secluded cottage you’ve booked for a getaway. So when the weather cleared, everyone was keen to get out onto the road to see how the bike felt in the really real world. The roads around Thruxton, as anyone who’s ever been there knows, are not the best. They’re little country lanes with plenty of potholes and loose gravel. Not the nicest place to take your shiny new motorcycle, or so you’d think. But the VFR has lost none of its surefootedness. The bike feels unmistakably solid, but that’s not to say heavy. There is a certain air to the VFR that may come from the fact it tips the scales at a far-from-lightweight 213kg dry, but it carries its bulk low down and that may help it to give a balanced feel. Down the lanes, it was a simple matter to dodge the worst of the road crap and get a bit of a move on. It’s actually quite a tricky request when someone asks how the bikes handle. It’s … well … it’s … ermmm, neutral. It isn’t the fastest turning in, it probably won’t be the sharpest, millimetre-pefect steerer, but it’s close enough in every area to keep you happy. The riding position sits you a little more upright than a sports bike, a little more tucked than a " proper " tourer. The steering is just where you want it to be, given that position. Unless you’re crouched over the tank feeling like you’re gripping the front wheel spindle and braking deep into every bend, you don’t want knife-edge handling. The VFR’s steering is quick enough to cope easily with a panic bit of cornering when you’ve been caught by surprise, stable enough to let you tip it in a bit harder than you wanted to and still feel comfortable. The brakes do a solid job of hauling the relatively porky machine down to sane speeds. The new CBS on the VFR has refined the existing system. On the new one, using the rear brake only operates a single piston on the front left caliper – it used to operate the central pistons on both front brakes. Using two PCV – pressure/proportional control valves – the new system also lets you use the back brake lightly without operating the front. However, if you’re hard on the pedal, you’ll notice a slight dive at the bars as the single front piston kicks in. Then you’re out of the corner and it’s back to that engine. The burble as it winds up from low revs is pleasant but the howl over 7000rpm is enough to make you grin, kick up a cog and do it all again. And again. Honda has reworked the gearbox to put the first three gear ratios closer together, effectively adding get-away grunt for those fully-laden uphill starts. Riding by yourself, you really notice it – there’s hardly time for your left foot to take a break as you accelerate to something over 80mph and charge through those lower gears. You could stretch it out by running each gear out to the redline, but the way the engine makes the torque it’s pretty natural to shift around the 10,000rpm mark, a little short of peak power. With a one tooth smaller front sprocket, the sharpness of the acceleration continues right through to top gear. The launch bikes were all fitted with kilometre speedos – they were intended to be run in Portugal – but whatever scale they read in, the big numbers come up quickly. You’ll be looking at 140mph (225kph on our bikes) in a pretty short space of time. Incidentally, the numbers are literally big – the digital speedo features some pretty large figures, so it’ll be hard to tell the cops you had trouble seeing what speed you were doing. Although you’re well past the best of the torque, the engine pulls willingly past peak power at 10,500rpm, past the redline, to the limiter at about 12,500revs in any gear. Without the room or weather to run it absolutely flat out, top speed is a matter of some guesswork, but it’s going to be in the over 160mph region, and that’s got to be enough for most riders. If you think you need more, the bike would probably handle the return to a bigger front sprocket, though you would obviously lose something in the acceleration then. Aiding and abetting such bad behaviour, is an improved fairing. It may only affect riders of certain sizes, but at five foot nine inches, I’ve found wind blast to be a surprising problem on earlier VFRs. In particular, carrying a pillion could make your head bob about in the airflow as the draught was upset by the pillion’s presence. Considering the market the bike is aimed at, that is a strange oversight. With the new bike I didn’t have the opportunity to try riding with a pillion, but one thing is certain – the new screen takes more blast off you than the old one. The new riding position is very close to the old one, but somehow it also makes it a much more comfortable and practical proposition to get down behind the bubble and out of the wind. It may be that the screen is simply higher, though there will be an optional high screen offered as an official accessory. That high-speed comfort will make a dramatic difference to the sort of people Honda believes buy the bike. Not madcap law breakers, but those whose idea of fun is a long trip across Europe, with a twisty road at the other end. You’ll be able to sit all day on Autobahns at 150mph without suffering unduly. And when you get there, you’ll still be able to enjoy yourself, on and off the bike, without help from a chiropractor. The engine mods claim to offer riders all the benefits without the nasty pay-offs. In other words, like a Muller yoghurt, Honda promises all the pleasure, none of the pain. The good bits are the better power from the engine, the increased performance from the bike as a whole. The downside should be a thirstier motor, a smaller tank range and much gnashingof teeth as you stop for the third time in two hours to put yet more gas in the tank. Instead, Honda claims the V-TEC will get you even further for your gallon. Obviously, it depends how you ride, but Honda claims up to 20 per cent better efficiency than the older carburetted models, and something like 10 per cent over the current model. The new injection system features 12-hole injectors to supply the motor with a far finer fuel spray, while the V-TEC design means that when only two valves are used, the resulting swirl in the combustion chamber gives a more complete and efficient burn. We’ll have to wait and see how it turns out when we give the bike a longer test, but combined with a tank up from 21 to 22 litres, we should be looking at a bike that will go further than ever between fuel stops. One area where the new bike felt different to older models was in pulling top gear at low revs. 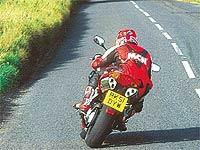 Where previous incarnations have coped easily with letting the revs drop to silly levels, the new VFR didn’t like hauling sixth gear from the barely ticking over standards of the old engine. Maybe that’s no bad thing – after all, you shouldn’t be subjecting your bike’s engine to that sort of hard labour when there are another five ratios to play with. But the fact is, you can’t be quite as lazy with this one as with its predecessor. Instead of pootling down to walking pace and zooming off again without dropping a cog, now you’ll have to change all the way down to ooh, fifth gear instead. The engine is still amazingly flexible, however, and it does let you ride in a pretty lazy way when the mood takes you, it’s just that now there is a much better reward for keeping the revs up – that over 7000rpm kick. Maybe the extra fuel efficiency will have to wait until you’re on the motorway, because unless all your senses are dead or you’re some kind of fuel efficiency pervert, you won’t be able to resist the coincidence of power and noise the V-TEC sparks off. Detail changes may not please die-hard VFR owners. While the price has been kept down to the same £7995 of the current machine, there are a couple of places where the cost has been trimmed. One is certainly the gear-driven cams. For all Honda’s talk of fuel-efficiency, smaller engines and reduced internal friction, there is no getting away from the fact the gears were a spectacularly expensive way of curing the VF750’s problems. That may not matter in practice, so long as the new engine proves reliable in practice, and with nearly three years of development under it, it’s a fair bet it will. Another such area is rear preload adjustment. On the standard bike you use a C-spanner to load it up on the shock, unless you’re prepared to pay £500 more for the ABS-equipped bike, which features a remote adjuster knob as standard. Considering Honda expects you to also buy its new range of luggage and touring accessories, that seems rather a venal move. If you’re going to be loading luggage on and off, you’re also going to want to alter the rear ride height. What you’re not going to want to do is skin your knuckles repeatedly as you battle with preload on the shock body. Not a good move. There is a payback, however. All this bodywork looks expensive. You wouldn’t want to drop that lot, would you? At least a carpark-type spill won’t break the bank. Having seen one slide on its side at around 20mph, everyone expected to see a mass of cracked and splintered panels from front to back. Instead, just two panels were scraped – the top fairing and fairing side. There was a light graze on the mirror, some small damage to the bar end weight and tiny scrapes to the underside on the pillion peg. That’s it. No cracks, no scrapes to fork legs or front mudguard, tail unit or those very pricey looking exhausts. All the indicators were intact and unhurt. Overall, though you wouldn’t be happy to drop it, you might well be pleasantly surprised to find it looking so lightly damaged. Valentino Rossi won the world 500GP title this year for Honda. That must have taken up quite a bit of the firm’s attention. Designing the all-new V5 RC211V – the four-stroke GP racer for 2002 – must have taken huge time for the designers and engineers over the past couple of years. It’s nice to know there was still enough left at Honda HQ to come up with the new VFR. The redesign has taken a full three years development and it shows. The bike isn’t dramatically different to what has gone before, in all areas bar one. There are subtle revisions to keep the handling up with a market that is always progressing. The new brake system will presumably roll out across Honda’s range of touring-oriented machines. But the engine is unique to the VFR. Honda has long championed V4s in various guises, from racers to tourers, but it has taken a big step forward with the V-TEC version it has given us in the VFR. Though there are a couple of Japan-only machines already running it, for most of us this is the only time we’ll use a V-TEC motor in a bike. For the time being – in the future there may well be a much wider choice. The idea seems particularly well-suited to bikes. Get ready for more, but in the meantime test ride a VFR.